With all the hype surrounding the remake of Final Fantasy VII floating around the internet lately, and with the lack of classes for the next couple of weeks, I figured now was the best time to get re-acquainted with one of the most applauded and well-loved RPGs around. 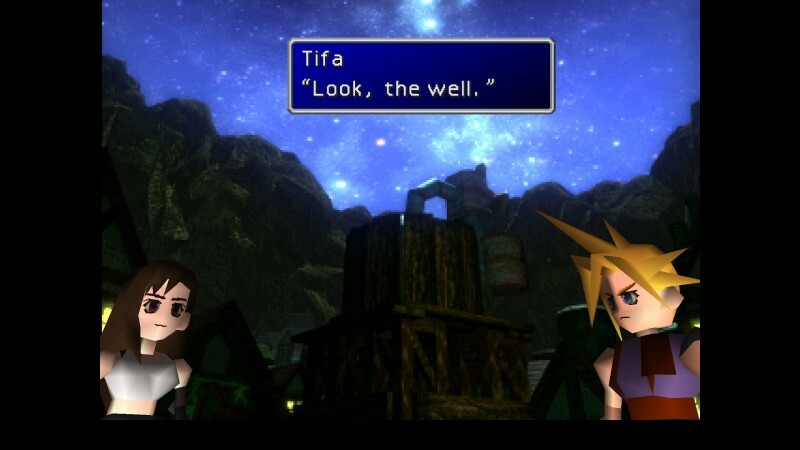 (It also didn’t hurt that FFVII was on sale for $3.60 on Amazon/Steam on Black Friday, either…) For those of you who haven’t ever played the game before, there are some spoilers in here, so be forewarned. Now, I’ve got a long history with this game. A long and ridiculous history. It goes way back to 1998, after the game first came out – I wanted to play it, really badly, but my mother didn’t think we needed a PlayStation in addition to our slew of Nintendo consoles. So, I borrowed a friend’s player’s guide and read through it. I read through the freaking instruction manual for the game a billion times. I’d listen to the neighbor kid tell me his progress in the game as he worked his way through it, living vicariously through him. 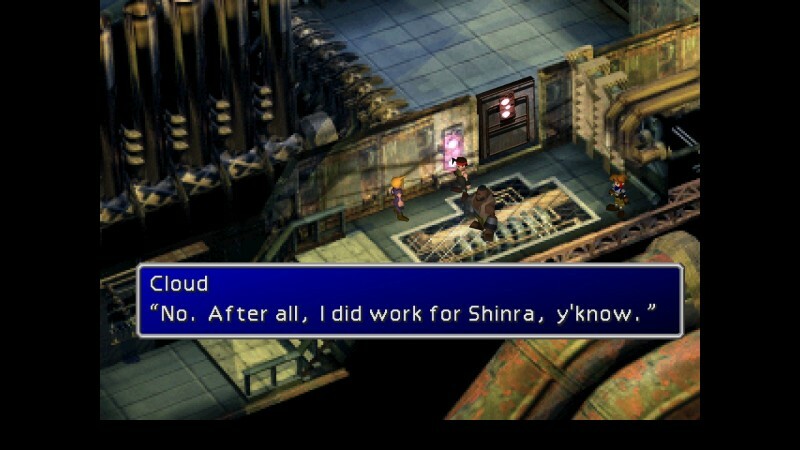 And when I finally made it to college, and got a job, I bought the PC version of Final Fantasy VII. And man, was it buggy, and playing it on a keyboard was rough, but I loved it. I soaked up all the fan fiction and fan art I could. Somewhere in my ancient stash of MP3 backup CDs, there’s a disc full of FFVII music I downloaded from Napster way back in the day. That game was my life. After classes ramped up, I ended up putting the game aside – and if I remember right, I ended up loaning it to a friend, never to be seen again. Fast forward to when I managed to acquire a PS1 of my very own – I bought a used copy, and played it religiously until midway through Disc 2, I think, where my copy had a scratch and simply refused to go any further than a cutscene somewhere in Cosmo Canyon of Red XIII howling at the moon. 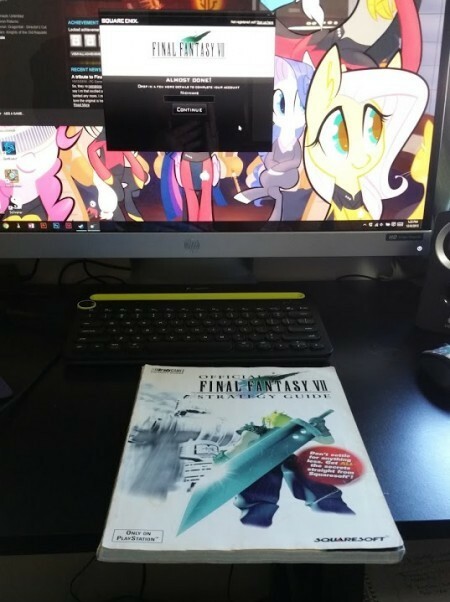 Some years later, my friend Patty gave me her copy of FFVII and the player’s guide, and made me very happy. And I played the heck out of that, from the beginning, because I lost the memory card that my original save game was on. Then, of course, I sold my PS Vita because I never actually used it for much aside from the occasional “oh maybe I should play Final Fantasy something-or-other”. So, Black Friday this year rolls around, and I figure, why not? I’m gonna buy a fifth copy of FFVII on Amazon/Steam. Because I can, and because I am DETERMINED to beat the game. Even though I know how it ends, because my friend Tyler spoiled it all for me back in 1998. So I did, and I even found the dongle that allows you to hook up a PlayStation 1/2 controller to a computer through USB. Success! Another observation I had: I don’t know if the characters always looked like this, or if this is just due to playing an old game on an HD computer monitor, but whoa, do the characters eyes look WEIRD. The pixelated eyes on the smooth polygon characters is… kinda unsettling on an HD monitor. They’re incredibly pixelated, compared to the typical gameplay character models. And it’s weird. Did they always look like that, or is it just emphasized because they smoothed the heck out of the character models? I have no idea. I’ll say this for sure – the game looks far better on smaller screens, like the Surface Pro – you don’t notice the super-pixelation or the weirdness with the eyes on the character models all that much. 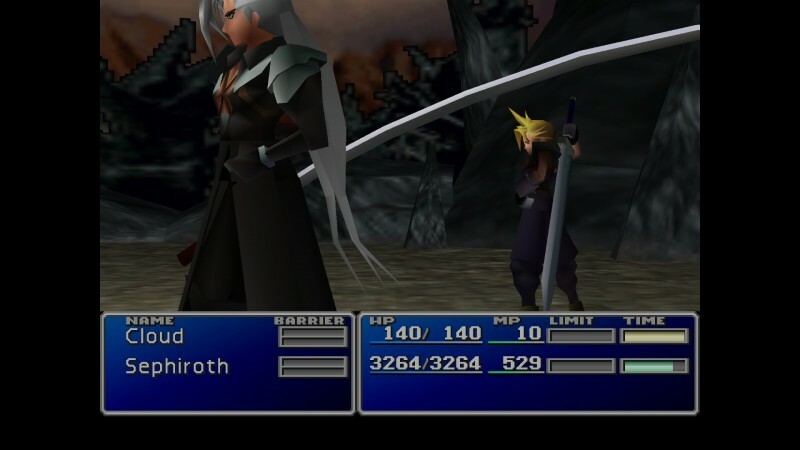 Awkward shot of everyone’s favorite super-villain, Sephiroth! The battle character models look a bit better than they used to, which is nice! The polygon smoothing and extra sprucing up worked out well in this department. They’re good looking, better than 1997 standards. I actually kinda like going into battles, especially with newly acquired characters, to see how spiffy their models are looking. One thing that hasn’t changed at all are the quality of the cutscenes. Which were absolutely fantastic for 1997, and are a little grainy now but still hold the storytelling impact they previously did. 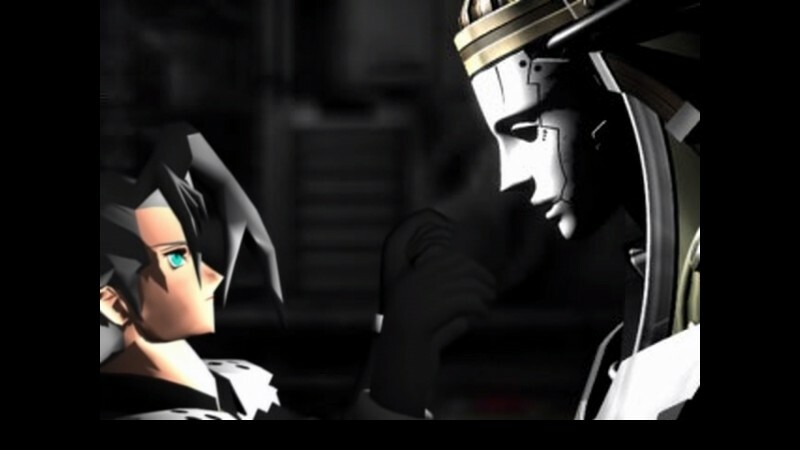 I spent last night holding my controller tightly as Cloud talked about his past with Sephiroth, and even after playing through Kalm Town for the third time, I still find the story as immersive and gripping as I did the first time I played it.